I think I started this quilt for myself about five years ago. Between wedding quilts and various other craft projects I would go back to it and do a little bit more. I think I also unpicked the whole thing at one point to make a more interesting pattern (what was I thinking?). 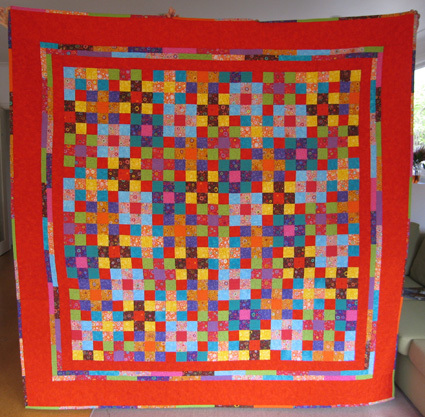 When Amy and Luc's wedding quilt was being quilted, I also sent this off. Then it had to wait again to be bound, until finally last weekend, when Kate and I had a sewing day, it got the last edge of binding sewn on and hand stitched. PS I'll post a pic of it in the room once I've finished painting.